Posted December 13, 2017 by Alec Smart & filed under City Hub, Featured City Hub. Mike Baird’s legacy gets another boost as the fight for Redfern Station upgrades and new stations for the proposed Sydney Metro Line continue within the NSW Government. Meanwhile the community, University of Sydney and other stakeholders are ignored. Baird was known for his love of taking assets held in public hands and flogging them to the nearest developer, often at knockdown prices. Who would have thought a few years ago that Redfern Station would become the focal point for stoushes between the State Government, the local community and the University of Sydney, and all for different reasons. For the University of Sydney, it is about timetables being altered to bypass Redfern Station for Central, forcing many of around 10,000 university students travelling from western Sydney and the Blue Mountains to change at Strathfield to access the university. “These timetabling changes create major complications for the university’s already significant public transport pressures, and in a further blow, we were dismayed that these changes have happened without any consultation with those affected,” a University of Sydney spokesperson said. The timetable changes are even more staggering when trains bypassing Redfern Station directly to Central only save three minutes of travel time. The University of Sydney is also currently arguing its case for a dedicated station on the proposed Sydney Metro route and light rail options along Parramatta Road. Both of these proposals have competing interests, with UrbanGrowth NSW Development Corporation being unclear which option they favour. 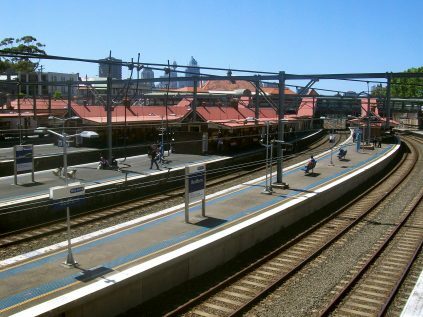 Mike Baird, as premier, voted in favour of a station at Waterloo, putting paid, for the time being at least, to the University of Sydney’s dedicated station. This decision was made after the university’s Campus Infrastructure Services offered a commitment of $1 billion in private funding to develop space around the proposed station with retail space, underground parking and open space. The university predicted that 36,000 trips through the space would be made daily. For Greens member Leong the battle with state government consultation and transparency has also been long and frustrating, but she sees a station upgrade as the primary issue. This week, the University of Sydney received the news that after repeated refusal by the government to discuss the rail issues affecting the institution, there has finally been a breakthrough. “We are pleased that the minster has responded to our letter and we are also grateful that Sydney Trains has contacted us for a meeting and we look forward to making our case in person for upgrades at Redfern Station,” Spokesperson, University of Sydney said. The State Government’s reluctance to address these two important issues is even more extraordinary when UrbanGrowth NSW Development Corporation’s sale of a lease for part of the Australian Technology Park is taken into account. The right to develop a parcel of the publicly-owned land was sold to Mirvac for $263 million, filling Mike Baird’s coffers even further. In no time at all, after the ATP deal, Mirvac were behaving like weasels when they objected to paying the City of Sydney $9.5 million as part of their community contribution. “We know that they are more than happy making huge profits selling off pubic land and over developing areas in the interest of development companies than they are providing the necessary infrastructure needed to maintaining that type of development,” Ms Leong said. Mirvac long-term plans for the precinct are massive and include leasing 93,000 sq. m of new office space to the Commonwealth Bank. Most of the bank’s 10,000 new jobs will be sourced from existing positions that will relocate from Parramatta, Sydney Olympic Park and Lidcombe. The University of Sydney estimates that their student population will increase by an extra 26,000 over the next 20 years. After three years there have still been no hard or qualified decisions being made by the NSW Government on any of these aforementioned issues and it seems once again the community that are left unheard.